We are standing together for our water. 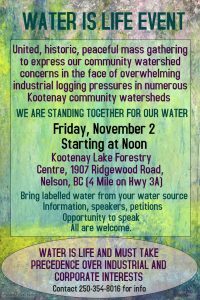 Peaceful mass gathering to express community watershed concerns in the face of overwhelming industrial logging pressures in numerous Kootenay community watersheds. Opportunity to write letters to the government. Petitions will also be circulated.